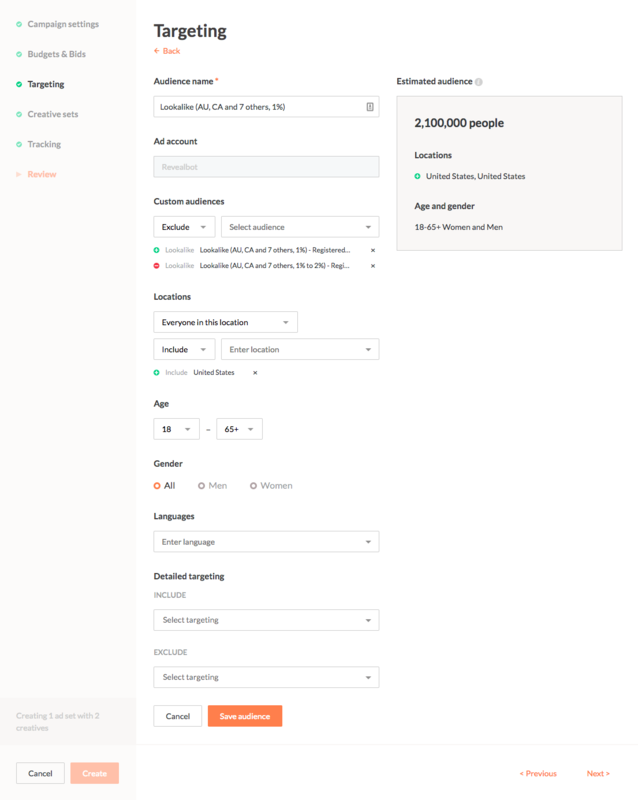 Bulk Creation is a tool that allows creating campaigns, ad sets, and ads right from Revealbot’s interface. 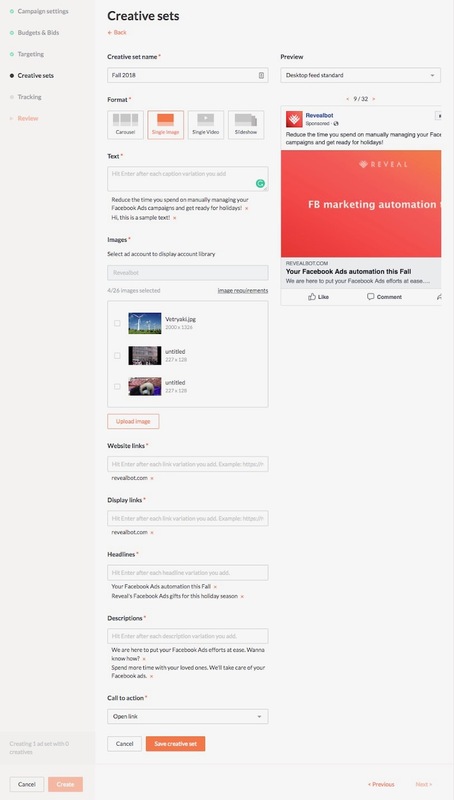 Comparing to Facebook Ads manager, Revealbot’s Bulk Creation adds a new value to your marketing strategy: by forming different variations of ad sets, you save time on long hypothesis testing, increase the efficiency by reducing manual work, get to see all of your combos before they get created, have the ability to split audiences, and see their reaction to each creative. It is easy to use and lets you multiply headlines, texts, images/videos, links, headlines, and call to action buttons to create and test new ad combinations in just a few clicks. This tool allows you to create and launch campaigns either from scratch or using some existing elements. Audiences and creative sets that you create in Revealbot are saved and can be reused. 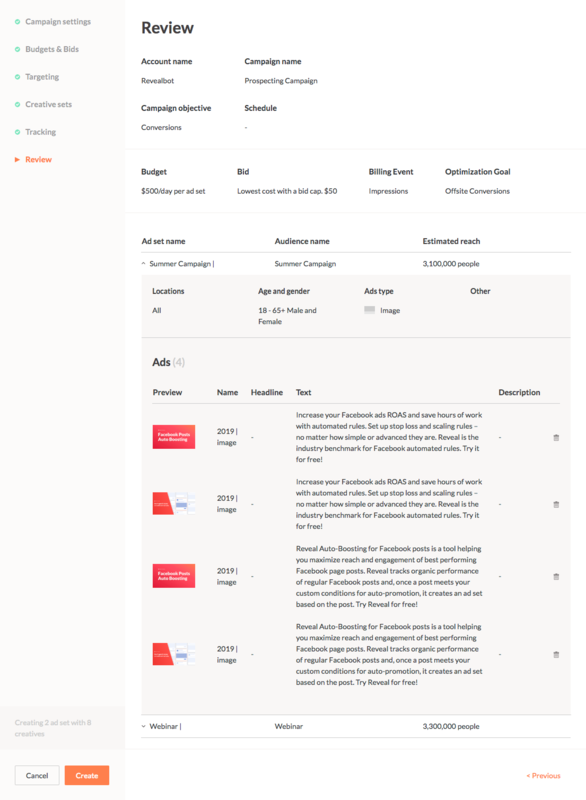 Bulk Creation includes Campaign settings, Budgets & Bids, Audiences, Creative sets, and Tracking. Let’s see how each one works step by step. Start by choosing your Facebook ad account. 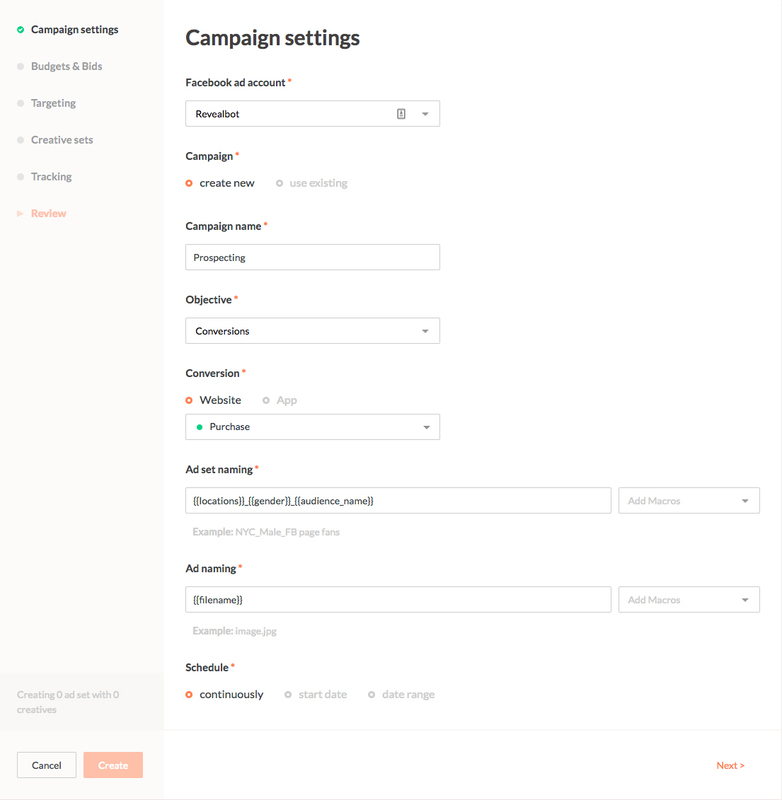 Then select whether you want to create a new campaign or choose an existing one. Next come the ad set and ad naming. You can type in the desired name or select predefined macros to generate the names automatically. Continuously, which will set the start date to today, without an end date. Start date, which will set the start date to a given date. Date range, which sets both start date and end dates. Choose the one most suitable for your needs and move on to Step 2. 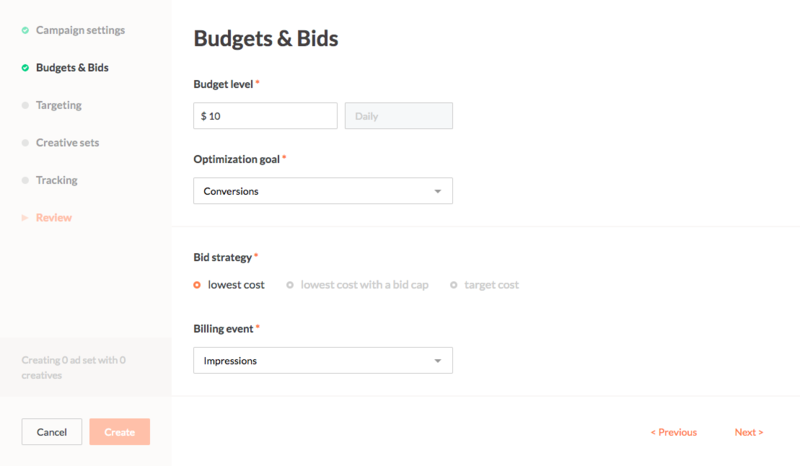 Set your Budget and choose the Optimization goal. Then, there is the Bid strategy. It can be either lowest cost, lowest cost with a bid cap, or target cost. Note that target cost strategy is only available for campaigns using the lead generation, app installs, conversions or catalog sales as their objectives. When you’re done, the «Next >» button will take you to Step 3. In Placements, you’ll be able to choose either automatic or custom placements. Depending on the objective you choose, some placements may not be available. Targeting mobile and desktop devices is also possible. Next, choose one or more Audiences you would like to target. For each one of them an ad set will be created. All audiences that you create in Revealbot will be available for future use as well. By clicking «Create new» button you can set up a new audience from scratch. Make sure to do this if you are using the tool for the first time. This process is similar to creating a Saved Audiences in Facebook Ads Manager. All custom audiences and look-alikes that exist in your ad account will be available in the drop down. Then select demographics, locations and other settings. Click Save and your first audience is ready. All your audiences created in Revealbot will be available for future campaigns. You can use multiple audiences for one ad set. When it’s all done, move on to Creative sets. Here comes Revealbot’s Bulk Creation core feature. By uploading different types of content, you create multiple ad sets and ads within them. Go ahead and click on «Create new» button. Set a name, pick the format, add one or a few variants of texts, images or videos, headlines, descriptions, links, headlines, display links, and calls to action. Check out the preview section, to ensure the creatives look like expected. Last but not least, the Review. Enable Facebook Pixel, App Events, and Offline Events (for example, offline store visits), if necessary. In Review, you’re able to see everything that has been chosen in the previous steps, a summary that shows the actual ad sets and ads that are going to be created after hitting the «Create» button. Make sure all ads are what you want them to be and delete the unnecessary ones.